To support implementation of the Genealogical Proof Standard , Olive Branch Cemetery Restoration endeavors to provide researchers with enough information to generate a "...complete, accurate citation to the source or sources of each item of information"  in our database, map, and image collection. OBCR took possession of the original Bayside Cemetery burial ledgers in the late 2000s. The burial ledger entries in our NY Database are derived from OCBR's ledger indexing efforts. Source List Entry: Olive Branch Cemetery Restoration, compiler. "Bayside Burial Ledger Database." Database. Olive Branch Cemetery Restoration. http://www.olivebranchcemeteryrestoration.org: 2012. First Reference Note: Olive Branch Cemetery Restoration, compiler, "Bayside Burial Ledger Database," database, Olive Branch Cemetery Restoration (http://www.olivebranchcemeteryrestoration.org: accessed 18 February 2012), database entry for John R. Doe (1752-1843). Subsequent Note: OBCR, "Bayside Burial Ledger Database," database entry for John R. Doe (1752-1843). OBCR obtained digital image files of the Bayside Cemetery "Index Card" collection in 2011. The cards were created by Bayside Cemetery (it is presumed, to complement the older, ledger-style burial registers). The cards were scanned by a third-party company in late 2010 - early 2011. OBCR also possesses digital images of the original index cards acquired, in person, in 2010. At present, OBCR does not possess the original index cards. The dates on the index cards extend from the 1880s to the early 2000s. Index cards are alphabetized in batches according to last name (e.g., A-, Ad-, Al-). The majority of index cards, similar to the example shown to the right (click image for detailed view), include a given name, surname, day, month, year, and burial location (absolute and/or relative). Variations do exist, including, but not limited to: surname only, year only, absolute location only, notation of stillbirth, contact name, contact address, and details concerning disinterment. To assist researchers in interpreting index card content, we have carried out a random cross-comparison between ten index cards and the New York City Death Index . The results of this cross-comparison are shown in the table below. On the whole, Bayside index card dates tend to match the dates in the NYC Death Index, which correspond to dates of death. 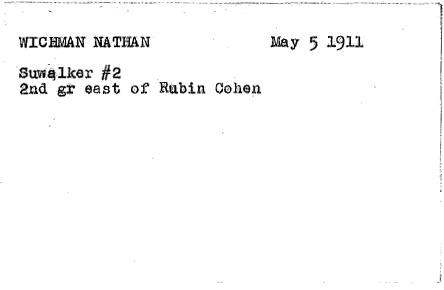 Index card dates before (e.g., Wichman) and after (e.g., Roth) NYC Death Index dates are also identified. We surmise the former results from "indexing" errors during the original preparation of the index cards from burial ledgers. The latter, in agreement with visual inspection of gravestones, suggests that, in some cases, index cards reflect the date of burial. The analysis also reveals slight to moderate variations in given name and surname spelling, which may be of interest to family members and genealogists. Source List Entry: Olive Branch Cemetery Restoration (Salt Lake City, Utah). Olive Branch Cemetery Restoration. Card file, database and images. http://www.olivebranchcemeteryrestoration.org: 2012. First Reference Note: Olive Branch Cemetery Restoration (Salt Lake City, Utah), Olive Branch Cemetery Restoration, card file, digital images (http://www.olivebranchcemeteryrestoration.org: accessed 18 February 2012), card for John Doe, [our cards are not numbered], citing society/association/lodge X, lot Y, grave Z. Subsequent Note: Olive Branch Cemetery Restoration, card file image, John Doe, [our cards are not numbered]. Cemetery and lot maps are prepared by Olive Branch Cemetery Restoration board members and volunteers. Larger-scale maps showing the entire society/association/lodge arrangement in a given cemetery may stem from original cemetery records. Detailed lot maps are typically prepared by in-person visits and gravestone image geotagging. Source List Entry: Olive Branch Cemetery Restoration (Salt Lake City, Utah). Olive Branch Cemetery Restoration. Cemetery maps, images. http://www.olivebranchcemeteryrestoration.org: 2012. First Reference Note: Olive Branch Cemetery Restoration (Salt Lake City, Utah), Olive Branch Cemetery Restoration, cemetery maps, digital images (http://www.olivebranchcemeteryrestoration.org: accessed 18 February 2012), map for John Doe, citing society/association/lodge X, lot Y, grave Z. Subsequent Note: Olive Branch Cemetery Restoration, cemetary map image, John Doe. Gravestones and cemeteries are photographed by Olive Branch Cemetery Restoration volunteers. All photos on this website are copyrighted material and all rights are reserved. Commercial use is prohibited. Personal, educational, and non-profit use is allowed without written consent. Source List Entry: Olive Branch Cemetery Restoration. Olive Branch Cemetery Restoration. Digital images. http://www.olivebranchcemeteryrestoration.org: 2012. First Reference Note: Olive Branch Cemetery Restoration, Olive Branch Cemetery Restoration, digital images (http://www.olivebranchcemeteryrestoration.org: accessed 18 February 2012), photograph, gravestone for John R. Doe (1752-1843), Salt Lake City, Utah. Subsequent Note: Olive Branch Cemetery Restoration, Olive Branch Cemetery Restoration, photograph, gravestone for John R. Doe (1752-1843), Salt Lake City, Ut. Rose, Christine. Genealogical Proof Standard: Building a Solid Case (San Jose, California: CR Publications, 2005). Board for Certification of Genealogists. The BCG Genealogical Standards Manual (Orem, Utah: Ancestry Publishing, 2000), page 1. Shown Mills, Elizabeth. Evidence Explained: Citing History Sources from Artifacts to Cyberspace, 2nd Ed. (Baltimore, Maryland: Genealogical Publishing Company, 2009). New York City Death Records Index, 1868 - 1948, http://www.theggg.org/NYCDEATHSEARCH.asp. Hereinafter cited as NYC Death Index.